Shelley Bean: Something Pink and Design Team News!! Something Pink and Design Team News!! Now, onto bigger news. Wednesday is the day you can check in to see what my wonderful Design Team ladies have to share with you. I will give you a hint...the theme is red, white and blue. I have had a couple sneak peeks and am so excited for you all to see what they have come up with. Our wonderful sponsor is My Heart Stamps for You...and stay tuned to hear about a very special offer from them! Also, we will be issuing a challenge to all of YOU that goes along with our theme, so be thinking of what you might like to show-off to us! We can't wait!! Oh, and did I mention there will be a prize awarded to one of our challenge participants? Lots of fun coming up! The give-away has one more week to go. Do you think we will make it to 200? If we do, I will happily give away the 2nd Cricut cartridge, Indie Art. I love the way your color. so perfect! this card grows on you like you said but when you look at the detail of colors you used it so much better :) tfs! Love the way you colored it! I have one Loralie Stamp. I like them. I like the unique woman that you have stamped here and the colors used on her. It is SPUNKY! You did an amazing job. I actually like that stamp. I might have to check some of those stamps out too. I am on stamp overload right now. I can't wait for this week. I am super excited! 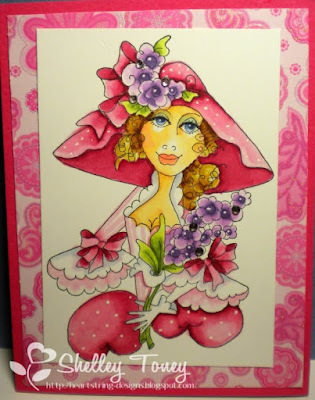 I really, really like the Loralie Card, your coloring is wonderful and all the detail so cool. Okay.. girl your coloring is amazing but so is your ability to update your blog so quickly! You just colored this at my class last night and you were with me all day today.. and ta da.... here is your masterpiece... again great job. Loved meeting you this weekend! keep in touch... PLEASE.... will follow your blog! That is some serious copic-ing.. LOL. Absolutelly fantast work! Wow, it looks really nice and I am so excited about the copic markers. Thank you, it is awesome that you are beyond 200. CNS Blog Hop-Blog Candy Winner! Canadian Nickel Scrap'n Blog Hop!!! So much to catch Up on! Copic Certified Designer and Something Exciting! Heartstrings Needs to Hit 100!